First of all pre heat oven to 200 degrees. Place an oven proof dish in the oven. Grease 4 to 6 ramekins with butter lavishly and dust each with coco powder lavishly. To coat the sides and base completely, melt dark chocolate and butter on a double boiler. Beat eggs, sugar, vanilla essence, pinch of salt till mixture turns frothy about 10 mins. Sieve together flour and coco powder. 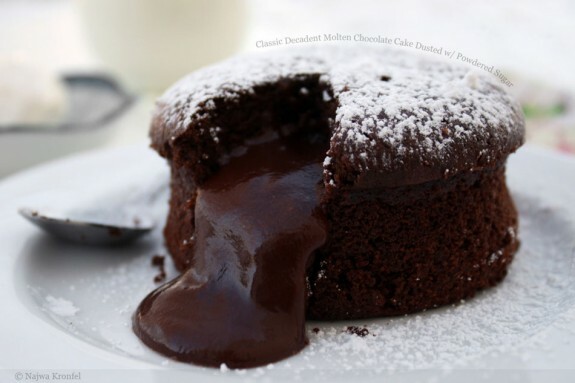 Bring melted chocolate and butter to room temperature and fold in the egg mixture. Stir in the flour using a spatula. Fill the ramekins ¾ full with chocolate mixture. Now place the ramekins on the pre heated oven tray and bake for 8 to 12 mins. When the surface of the cake appears to be done and edges of the cake leaning side of the molds remove from oven. Cool in the molds for 10 to 15 mins. Over turn gently. Serve with whipped cream or scoop of ice cream.